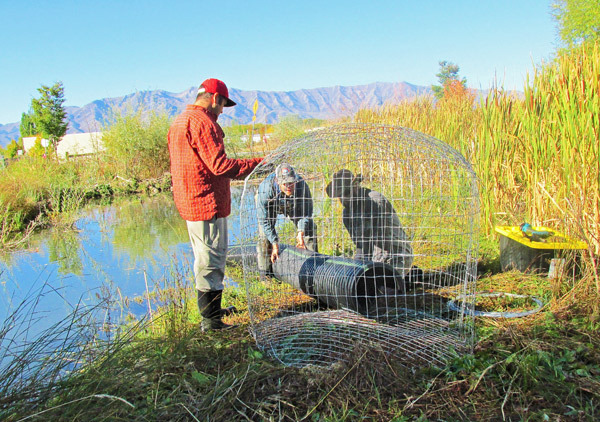 LOGAN – Three men bravely waded into a chilly pond one morning last week to save a beaver colony whose dams have periodically threatened to flood 1200 South behind Walmart in South Logan. Volunteers from Utah State University’s Fluvial Habitats Center (FHC) inserted “pond levelers” — drains to prevent flooding — as preventative steps to keep beaver dams from flooding of the road and nearby businesses. They also installed fencing around trees that Walmart hopes to protect from ravenous beavers. Since Walmart opened in South Logan in 2009, store managers have hired trappers to “lethally remove” beavers that inhabit the ponds on the property. But every year, more beavers return, said Nick Bouwes, owner of Eco Logical Research, Inc., which shares the FHC with USU’s Ecogeomorphology and Topographic Analysis Lab. Walmart approached the FHC last fall to develop a management plan for preventing flooding while preserving the beaver dam and colony. Elijah Portugal, a fluvial geomorphologist, said beavers play a critical role in river environments, and the team is implementing “living-with-beaver strategies” in this project. Bouwes believes inserting pond levelers should mitigate the problem. A pond leveler is a big tube that allows water to flow through a dam and ensures the water level will be lower than the top of the dam. Beavers don’t try to plug levelers because they cannot sense the running water, he said. Katie Currier, Northern Regional Coordinator of the Utah Conservation Corps, believes the pond levelers will allow for the habitat to function as it’s supposed to while preventing possible flooding damage to businesses, homes and roads. The project has been a lengthy process, Portugal said. Before inserting the pond levelers, they had to get approval from the U.S. Army Corps of Engineers, discuss the project with city engineers and work with members of Walmart’s Water Quality Department at the company headquarters in Arkansas. Bouwes sees the project as a small step in implementing living-with-beavers strategies. “It’s encouraging to see this collaboration between business, the city and people looking for solutions to live with wildlife while recognizing their benefits,” he said. Beaver dams can store water and release it slowly during the summer when it’s needed, capture sediment that can clog sewer systems or reduce water quality, and provide habitat for a lot of wetland species, Bouwes said. He believes these benefits outweigh the costs of living with beavers. If this strategy is unsuccessful because of high runoff next spring, Bouwes said Walmart would need to consider removing the beaver dam altogether. If the beavers continue to return, they should consider trapping the beavers for relocation, he said. I found this article interesting, I have dealt with beaver infestation problems at a few cell sites in central Mississippi and I am hesitant to kill the beavers. My solution at one such site near Tupelo MS, was to remove a section of their dam, lay in a 24 inch, 20 foot long drain tube to keep the water from getting any higher. The beavers filled in the area around the tube. They are quite industrious. They have tried to block the end of the tube when there is a lot of water flowing but they have not succeeded and the pond has remained at the correct level for 2 years now. The only problem from doing this is that the water tends to be more stagnant. The decaying wood that the beavers use has created a very oily sheen on the water and it is now an unsightly pond. The beavers have stopped expanding their cutting area since the water is not rising, they do not feel safe to go to the tree line. I expect that before too long, the beavers will leave for a better location. It is always better to try and get along with the beavers, people have to remember that some of our best meadowlands were created by the sediment capture that beaver ponds are responsible for. When the beaver pond outgrows the ability of the beavers to manage their dams, the move on, many years later, wonderful meadows are left when the stream returns to a more natural state. Here in Mississippi, some of the beast farmland was created this way. I congratulate Wal-Mart on attempting an alternate solution.